Mohamed Salah netted the only goal of the game from the penalty spot as Liverpool edged out Brighton and Hove Albion 1-0 on Saturday. The Egyptian king's 17th goal of the season saw the Reds extend their lead at the top of the Premier League to seven points. It almost feels trite to say it, but goodness me how important is Salah to Liverpool? With Brighton’s defence sitting deep and looking seemingly impenetrable, the Egyptian produced a moment of sheer magic to bamboozle his marker and win a penalty. And there was no doubt about the outcome when he stepped up to take it and - ultimately - claim all three points for his team. The Reds are so blessed to have a forward like Salah, one whose impressive goal tally is matched by the game-breaking moments he produces time and time again. A number of Liverpool fans were justifiably concerned when it emerged that Fabinho was set for another stint as makeshift centre-back against Brighton. But they needn’t have worried in truth - the Brazilian was immense as Virgil van Dijk’s partner in trying circumstances at the Amex. Not only did Fabinho help repel the dual aerial threat of Glenn Murray and Jurgen Locadia, he also contributed two crucial interceptions when the hosts looked certain to score. Klopp will want him back in midfield sooner rather than later, but he will be delighted with his summer signing’s contribution here. Normal service has been resumed. Liverpool banished their January blues as they returned to winning ways on the South Coast. It wasn't pretty and it wasn't totally convincing but the outcome was absolutely priceless. Klopp puffed out his cheeks at the final whistle and went over to applaud a relieved travelling Kop. Victory over Brighton - secured courtesy of Salah's second-half penalty - extended the Reds' lead at the top of the Premier League table to seven points. But when the pressure was cranked up, Liverpool delivered. Not with a show of brutal force, but by showcasing the qualities which helped them set the pace in the first half of the campaign. This was all about guts, hunger, unity, resilience and the steely work ethic Klopp has instilled. Never mind the towering majesty of Van Dijk or the perpetual motion of Robertson, my guess is the outstanding Liverpool player at the end of 2018-19 proceedings will remain Salah. The winner here was his 14th Premier League goal of the season, enough to share top spot in the charts with Pierre-Emerick Aubameyang and Harry Kane. No Liverpool performer is likely to be as crucial as Salah in the road to May and the growing possibility of that Premier League title. This was a crucial intervention to ensure a crucial victory. With Pascal Gross offending with both hand and left leg just after half-time, this was an absolute stonewaller, just as it was a nailed-on number when Arsenal’s Sokratis double-clipped the Egyptian’s calves the other week. But Salah seems to be perfecting that knack of getting the other side of a defender and, essentially, brake-testing his opponent. Scrambling back after being embarrassed by a wonderful footballer, the pursuer cannot avoid the tangle that ends with Salah on the deck. It is a subtle skill to go with his myriad other subtle skills, such as dispatching the kick with fierce accuracy. It was the slippery superiority of Salah that sealed the deal at the Amex and it will probably be his ingenuity that wins more of these tight encounters before the season’s end. 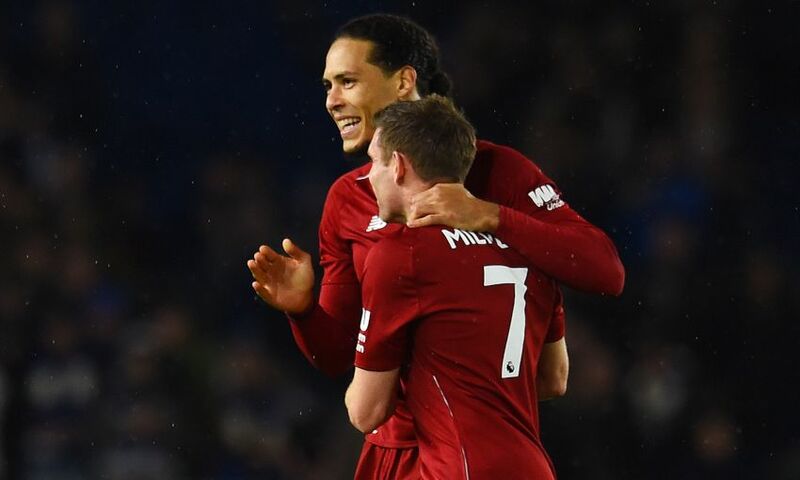 Liverpool got their balance back this afternoon, recovering from their New Year stumble, grinding out a 1-0 win at Brighton and Hove Albion that restores their lead over Manchester City to seven points. At least until Monday night. If Liverpool do this 16 more times this season - or even just 15 - then they lift the Premier League title this year. Yes it is only 12 January but this is the time of year when we stop adding games up and start ticking them off. The time when performance goes out of the window and everything is hung on results instead. That is why there was so much jubilation from the away end at full time, such a clear sense that the great enterprise that is Jürgen Klopp’s Liverpool is back on track. This was a classic title-chasing victory: away from home, narrow, nervy, never in total control, and reliant on a dollop of contingency to get them over the line. When they needed to win more than ever before, they found a way.